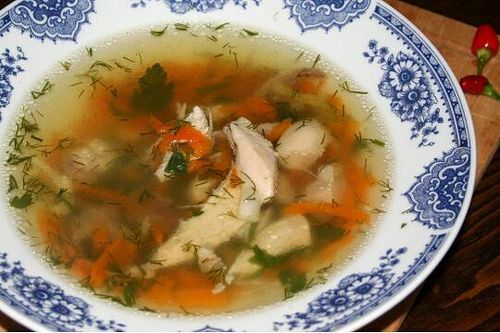 Remove and discard the skin from the chicken breasts and place the breasts in a large soup pot. Add the chicken broth, bring it to a boil and reduce the heat so that the broth just simmers. Simmer until the chicken is thoroughly cooked, about 15 minutes. Remove the chicken and transfer to a plate to cool. Skim the fat from the broth and bring it back to a boil. Add the tomatoes, onion, carrots, celery and red pepper. Simmer until the vegetables are soft, about 5 minutes. Add the orzo or other small pasta and cook for 5 to 8 minutes more, or until the pasta is al dente. Meanwhile, discard the bones from the chicken and chop the meat into small pieces. Add the chicken, escarole and oregano to the soup pot and simmer for another minute or two. Season to taste with salt and pepper. Serve in warm soup bowls with thick slices of crusty Italian bread. This is the chicken soup we would find on the dinner table on a cold winters night. My Mom, who worked out of the house, would do this sort of cooking on Saturday. (Sunday of course was “Gravy” day!) I big bowl of this chicken soup and some bread, and maybe a few links of sausage and fried potatoes to round out the meal. What a feast! Warmed you up all through the night . . . And then some!